General questions regarding Suitest and accounts. If you cannot find an answer to your question please contact our support. Your Suitest experience might be affected by the CSP restrictions, as Suitest has its CSP turned off because it negatively affects some of our features. Currently, if you have the "unsafe-eval" in your restrictions, Suitest will not function correctly. There is a possibility that other restrictions could hinder your Suitest experience. You can read more about CSP. No, the price you pay is for a one-time renting fee which is non-refundable. Suitest maintains ownership of the CandyBox at all times. There is no time limitation, as long as you are using Suitest. Suitest allows you to test Browsers, Xbox One, Android TV and Apple TV via SuitestDrive without a CandyBox, however, if you wish to test on Smart TV platforms (such as HbbTV / Freeview Play or LG webOS) then a CandyBox is needed to interface with your device via infrared. You can order a CandyBox unit or upgrade to a Super Sweet or The Sweetest plan which include a CandyBox. 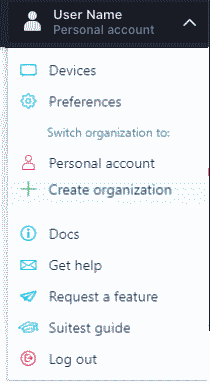 Open the drop-down, and press the Create new organization button. Optionally transfer all assets from your personal account. This transfers applications, tests, element repositories, test results, plan and used minutes. Ignore step 4 if you choose to transfer. Select subscription plan for your organization. Invite team members to your organization. Learn more about team members and their permissions. For technical questions please contact our support team (support@suite.st). If you have business inquiries please contact our sale team (sales@suite.st). We will try to get back to you as soon as possible! All applications must have our instrumentation library inserted into them either automatically or manually. The simplest way to verify that you have your application instrumented correctly, is to upload a package or add a URL to a configuration. Check running test in interactive mode for more information. Go to your preferences - billing area. Switch to the Billing information tab. Press edit button under the billing information. Could Content Security Policy (CSP) restrictions affect me in a negative way? Do I have ownership of the CandyBox? Do I need a CandyBox to start testing? Does Suitest have any integration with third-parties? How can I reach you best if I need some support? How can I make sure my application is instrumented correctly? What platforms does Suitest support?